What Can We Learn From the Bishop? Watching the Royal wedding from the top deck of a cruise ship surrounded by enthusiastic Americans was a sight I shall not easily forget. Those sunny pictures of a chocolate-box Britain will likely do next year’s tourism receipts no harm. 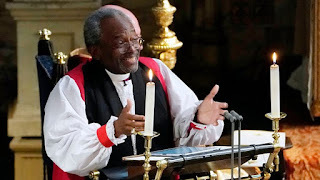 And for us broadcasters, maybe there was a lesson at this Windsor gig from Bishop Michael Curry - regardless of our thoughts on the wedding, or on faith. Here was a 65 year old preacher from Chicago - playing with the very vocabulary we have at our disposal each day, providing a memorable performance which is still being talked about weeks afterwards. That’s a goal for us all. He surprised. We’d had the wedding functionals, just like we have weather and travel in radio-land, and they’d played a few familiar songs. But he made us look up. It wasn't quite what we expected. The whole thing had been well-teased. We knew he was an American preacher - so it promised to be a tad different from Camilla's nuptials. But we didn't know quite what lay in store. We knew enough but not too much. And we wondered. Curiosity is a hugely powerful thing. He used the word 'you'. This was not some abstract lesson - it was about each one of us. "If you don't believe me, think about a time when you first fell in love. The whole world seemed to centre around you and your beloved." We nodded. "Let me tell you something". He’d prepared. Probably a little better than some major presenters do for key links. He knew his theme well and he’d thought it through. He didn't wait for the last organ note and then wander into the pulpit hoping for inspiration. He brought notes on the ecclesiastical iPad - but didn't always rely on them. He felt the mood. His vocabulary was clear and descriptive. We could picture what he spoke about. There was word repetition in this message - anaphora. Great speakers rely on it. 19 uses of the word 'power' - and 68 of love. “There's power in love. There's power in love to help and heal when nothing else can. There's power in love to lift up and liberate when nothing else will. There's power in love to show us the way to live. But love is not only about a young couple. Now the power of love is demonstrated by the fact that we're all here." His delivery was beautifully-paced – from a sombre stroll to a real gallop - and pauses for effect. Wonderful Radio 4 newsreader Peter Donaldson used to say pause "until it hurts". Too many of us don't pause and give the listener time to think - and to respond. There was humour. Light and shade. Reverentially irreverent. "Two young people fell in love - and and we all showed up". Like most radio, it wasn't laugh-out-loud, but a sprinkling of wry smiles. In many radio formats, amidst the most serious of topics, there are smiles to be had - and in today's world, we need them more then ever. He was himself. Yes he was in an unfamiliar place – and he adapted what he said for the audience, yet this was still him. He was authentic. There was passion - and we believed it. His boss had not written his words for him - although He had certainly influenced. He played his voice like an instrument. Sometimes warm, sometimes verging on threatening. Sometimes a whisper close-up - and sometimes a bellow from afar. On occasions, he smiled as he spoke. He caressed every word. When he said 'love' – it sounded like love – and 'fire' sounded positively inflammatory. 'Power' was powerful. He was likeable. We don’t know him personally, but in the course of this short speech, we warmed to him. He is experienced. The Bishop was ordained in 1978. I suspect he is better at holding his audience now than he was back then. Simon Mayo is better now than when he was a callow youth on Radio Nottingham. Do we cast aside our best broadcasters too freely? He knew his audience. This was Harry and Meghan’s gig – and the couple's contemporaries connected more with a mention of Instagram than the Daily Star. He spoke our language; he knew we said car not automobile. What would his PD have said? Maybe a bit long? Could he have shaved a couple of minutes off and achieved just as much if not more? Probably. Which just proves than even the very best of us can be even better. 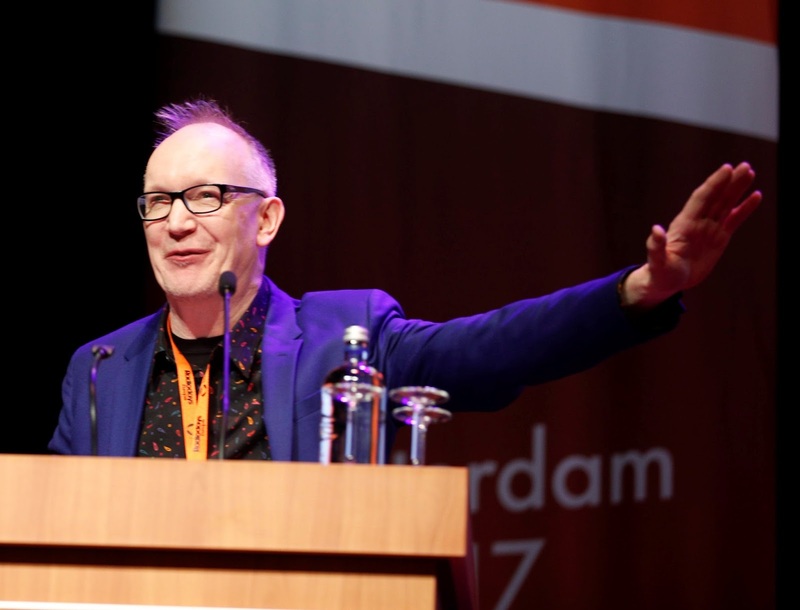 Need a conference speaker or help with strategic projects - or coaching or broadcast training? If we get on OK, I'd love to work with you. Is Big Really Beautiful - A Hyper Local Future? Big is beautiful. Unless you’re a BBC local radio station. The larger the area, the lower the reach %. 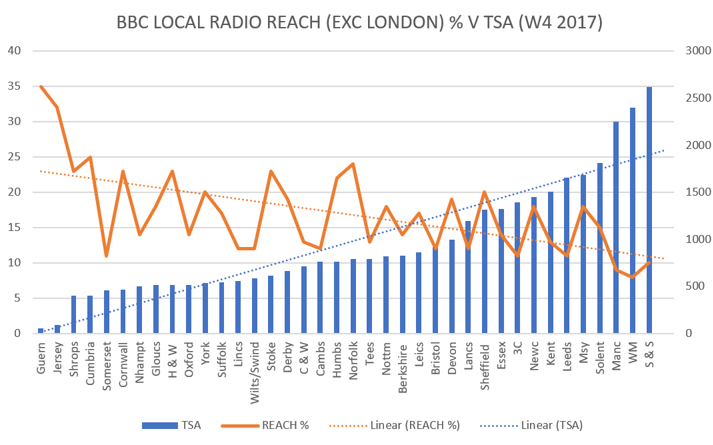 It’s not the fault of the folk who work at the larger stations – they likely work just as hard - and are also in more competitive cities with radio aplenty – and, in London, with head on commercial competition for the talk ears. Are there other reasons? Is there something about larger communities which means they feel increasingly less ‘local’? 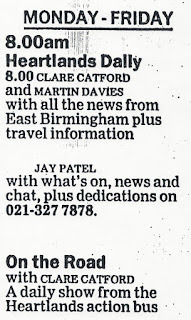 BBC local radio in London, the West Midlands and Manchester has always faced a tough challenge; and the BBC has tried a number of approaches in those areas, with both format solutions (GMR/GLR) and opt-out services, for example, 'Heartlands' in East Birmingham from BBC WM. Elsewhere, there has been a mix of approaches over the years. The BBC has amalgamated some services, only to choose to split them off again later. Others have remained amalgamated after previous rounds of budget cuts - and others retain some degree of sub-localisation. It’s interesting looking at the context of other media. Around the country as daily press titles in significant cities fall, some pretty decent online hyper-local titles rise, seemingly well supported by local readers and businesses. With no printing overheads, they can serve small communities where a local press title would be unsustainable. Whilst youngsters adore their city living, families may choose to start their families in the suburbs. This is ‘where they live’, not the big city down the road. Their high street is the one where they push the pram in then morning and meet their friends later. Town centres which once pulled down the shutters at five o' clock now have bijoux restaurants with blackboards outside and thriving pubs which stay open late – at which time the revellers can stagger home. At a time when arguably cities are becoming more homogeneous, is there a new sense of pride in smaller communities? It’s apparent that smaller areas can love their radio stations. The station is a real symbol of pride. Despite the excellent performances of top notch commercial and BBC stations in my home patch of Nottinghamshire, Mansfield FM, the commercial station serving a town some 15 miles from Nottingham’s centre, punches a great 28% reach. 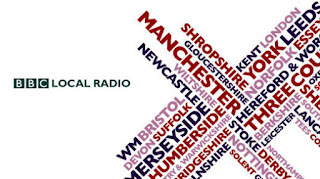 BBC local radio’s 40 stations use 93 FM transmitters. Whilst there is some split frequency use, there is the potential for more. 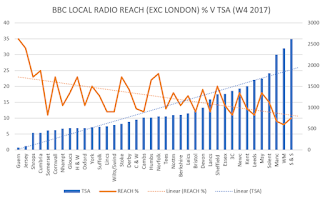 Putting to one side any relevant OFCOM operating framework considerations, could there be merit in the BBC implementing further localisation, at a time when commercial radio is taking steps in exactly the opposite direction for quite understandable reasons? Yes, it's been done before in some areas, but times change. And how well was it done? Could BBC local stations originate significant additional hyper-local programming for proud distinct areas, where they naturally exist, opting in and out of the mother ship for parts of the day or week? As my old colleague Keri Jones illustrated to me, this happens overseas. The tiny ABC South West Western Australia generates a breakfast show for the small, remote town of Bunbury. When they are not doing their own thing, they relay ABC South Coast in Albany which offers programming for a slightly larger, but still rural, part of W Australia. When ABC South Coast isn’t creating local shows, they relay ABC Radio Perth from the state capital of Western Australia. ABC Radio Perth provides local content until 10pm, then it’s national local radio programming overnight. So, in dinky little Bunbury, the programming hierarchy is: Bunbury – Albany South Coast – Perth – National. This is eminently deliverable from existing BBC local premises and infrastructure, and I believe existing resource. With DAB simulcasts too, the ‘home’ service could continue to be broadcast across the whole area, if desired. Or – the 128 kbps multiplex DAB capacity could even be split too – providing more than one service at once, albeit across the whole patch. 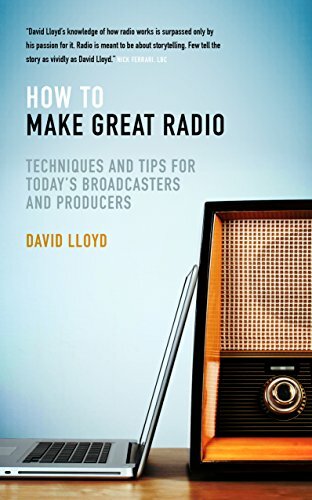 And, as BBC local radio listeners start to listen to more content 'on-demand', will there be further opportunities to create and disseminate hyper-local audio which is not even broadcast? At a time when we can personalise all our media choices, should radio be offering something a little more tailored? Would radio which sets its stall out to 'do local' do better if it were more local? Find the broadcaster who really knows and loves their subsidiary town and get them on-air to their neighbours. And now the news where you are. Or maybe not quite where you are - but a big city down the road. Election broadcasting is a real sport. An endurance test for the presenters, commentators and contributors. Pace yourself. When to sleep. What to eat. It's also a fine British tradition - and what presenter on-air does not feel in some way they are an echo of a bespectacled towering broadcasting figure from yesteryear as they begin their nocturnal marathon. There's certainly a temptation to indulge in the role as one self-importantly choreographs the future of the nation personally. Given the rich tradition, I wanted to highlight LBC's excellent, fresh offering last night with Iain Dale and former Home Secretary Jacqui Smith. 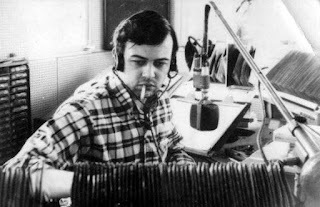 There was something in its good-humoured tone and approach which was an immaculate example of quality contemporary talk radio. Rather than General Election-lite, it was an enjoyable, informed grown-up, human conversation. Pointless and repetitive political sparring was replaced by honest, insightful dialogue amongst contributors who sometimes agreed. When they differed, it felt more like hearing the adult way politicians tend to debate on Portillo's sofa on This Week rather than simply witnessing a politician being roasted - which can feel as uncomfortable as watching your parents argue. Whilst there are times on media when hard challenge is utterly justified, it can often simply be annoyingly gratuitous. Journalists looking for a fight. No thanks. I'd rather you helped me understand something better. Great radio brings value. 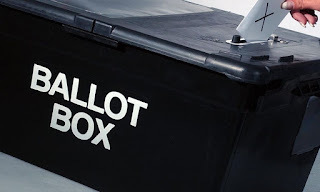 Is there much to gain by journalists simply haranguing candidates who might not have fared as well as they'd expected. Behind each victory or failure, there's a human being. LBC's approach reflected today's complex politics which can no longer be reduced to political parties, left and right. Life is much more complex than that. Local elections are also just that, and LBC went to great pains to reflect that these elections were not just about London. That's a real achievement for a station which was once simply a London offering. Again, that chimes with the national mood - at last there appears an awareness that life exists outside London, and LBC reflects that naturally. There were also a lot of women's voices, not least Jacqui's own. All well-cast. 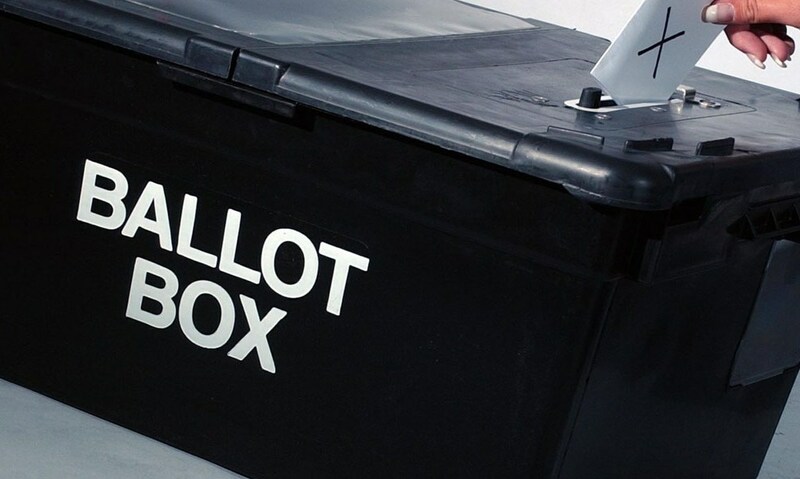 Elections have traditionally meant endless mumbling from sweaty dull bald blokes in suits, and it was so refreshing to hear a different tone, energy level and perspective. This was addictive listening - and engaging within seconds. This was the party you wanted to be at. Great informed company chatting away as events unfolded, as if from a Gogglebox settee. Really human radio - doing what radio does best - alongside a judicious spine of reliable reporting. Casting double acts is as challenging as finding the right marital partner, yet Jacqui and Iain are made for each other. Neat, well-timed interventions from each. The pair fell into each other's arms on the Sky News papers review - and that endures on their excellent 'For the Many' podcast. It's interesting mulling over whether beginning the relationship on the podcast alone would have been sufficient to build the chemistry to radio's standards. 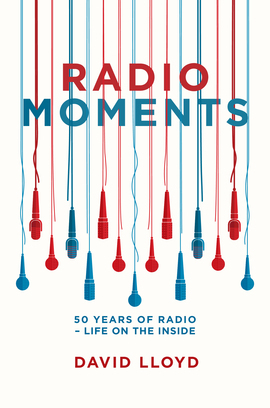 It likely would - and that's an interesting thought for radio programmers hungry for the next great double act but no radio day-part free to air and hone it. Politics has changed. It is right that political broadcasting should too. 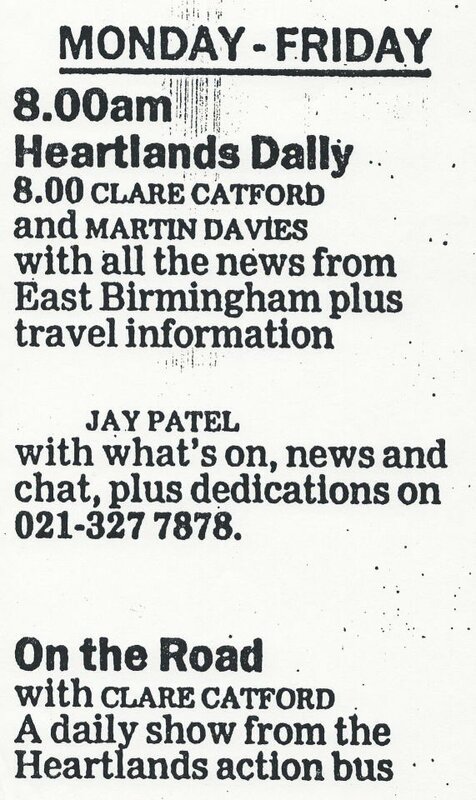 One reason I felt duty-bound to highlight this programme is because few radio critics will likely trouble so to do. I despair of how commercial radio content is so often ignored by many such individuals. It would be unkind to suggest they just rifle through the Radio Times to find something easy to write about, but it sometimes appears that way. They seem oblivious to the fact that 65% of UK adults catch some commercial radio every week; and that almost 80% of adults do not listen to Radio 4 even weekly. When I dared to express such a view on Twitter, one respondent questioned what on earth can one write about a sector which comprises mostly music radio. Well, if you cannot think of anything to write about LBC's array of innovative content; the way in which local stations respond to crisis; music policies; the new digital radio offerings; platform consumption; audience battles; key brand changes; or breakfast talent moves, you really should get another job.